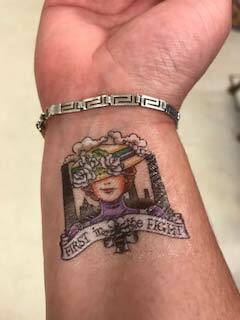 The suffragette movement started in Manchester, the home of Emily Pankhurst, and to mark the centenary, free stick-on tattoos were worn to celebrate Manchester being the first in the fight for the right for women to vote. 100 years ago, only men that were homeowners were allowed to vote so the Representation of the People Act 1918 was a major leap forward particularly for both women and the working classes of Manchester. The Pankhurst Museum in Manchester is the place to go to discover more about this important time in history. 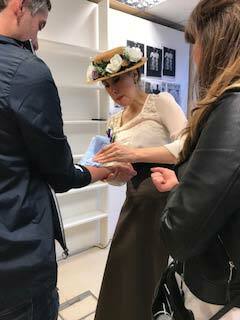 Over the August bank holiday, visitors to the art and craft fair at Plant NOMA in Manchester were treated to a step back in time to meet the suffragettes in full historical dress. Plant NOMA is an open design studio situated in Saddler’s Yard near Dantzic street and behind The Printworks. The building and workshops were donated by The Co-Op and the facilities are free to use provided that either for every item made one is donated back or a free workshop is offered to allow others to benefit from learning new creative skills. 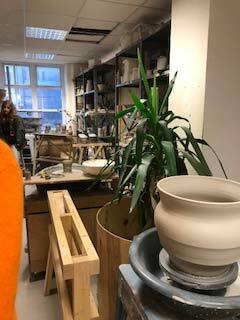 There are fully equipped woodworking and ceramics workshops and also a space for events and for people to get together to share ideas. Plant is also home to MadLab, a not for profit organisation that runs fun and creative IT and electronics courses for the public, ranging from learning to solder to 3D printing and Laser cutting. Noma is a joint initiative between The Co-operative and Hermes Real Estate. Also in Saddler’s Yard, and just across the square from Plant Noma, The Pilcrow pub is an amazing creation by the designers from Plant NOMA together with a team of over 500 volunteers. The entire pub from the structure to the furniture, bar, and even the beer pumps were hand made and produced at Plant Noma. 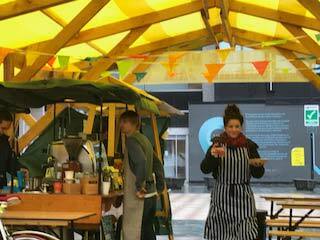 Within the square there is a large permanent marquee to house outside events. The marquee cover is made from reclaimed materials and again built by Plant NOMA. 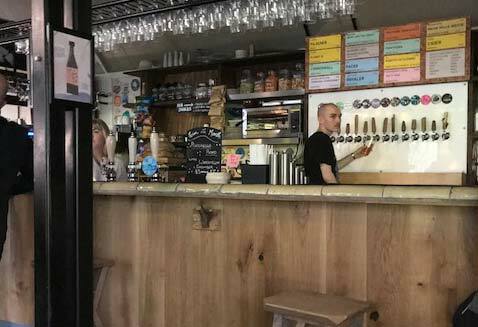 It’s a truly unique place and a great achievement by the local community in Manchester. There is always something going on at Saddler’s yard and Plant Noma, so pop in if you can and take a look around. It’s a free and exciting place for everyone to explore. If you can't get to the beach let the beach come to you! What a surprise to find so much sand in the middle of a city centre. Located in the amphitheatre at Great Northern, Deansgate, there is now a giant sandpit free for everyone to enjoy. It will be there until 09 Sep 2018 so pop over if you have small children or need a relaxing break from the shops. 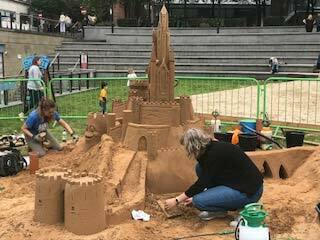 Also in the amphitheatre, you can watch the creation of some amazing sandcastles. Its incredible work and great marketing from On the Beach Holidays who are also running competitions as well.